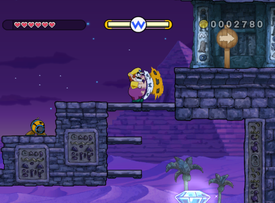 Disturbing Tomb is a secret level of Ratl Ruins in the game Wario Land: Shake It! It can be travelled to by finding a secret map in Whoopsy Desert. It is a desert level that takes place during the night. The background consists of purple-colored sand and pyramids. Disturbing Tomb is full of Mummers and Flipstings. Many quicksand pits also litter the area. However, there are two quicksand pits that leads Wario to treasure chests. This level is also littered with Bomb Blocks and many Blast-O-Cannons can be used here. The 'Golden Enemy' here is a golden Mummer and is also the only golden Mummer in the game. The following missions in this stage are six total on which Wario must do. On the first mission, Wario must complete the stage in less than three minutes. The other mission is for Wario to complete the stage without a single attack. On the third mission, Wario must collect at least thirty-six thousand coins total in the entire stage. The fourth mission requires Wario to defeat a golden Mummer found in the stage. Finally, the fifth and sixth missions require Wario to destroy all of the Bomb Blocks and eat five heads of garlic respectively. Gomi sabaku Pun on Gobi Desert. This page was last edited on March 12, 2018, at 18:57.